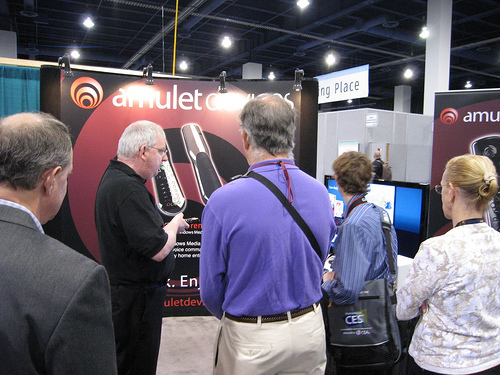 Amulet Devices is showing with our partners SMK Electronics Corp. booth South 1 – 20662, lower level of the South Hall, Las Vegas Convention Center, January 6-9. See the CES Map. We’re one of the participants at the #HoustonWinMeet which is on in Houston, Texas on 30 November. 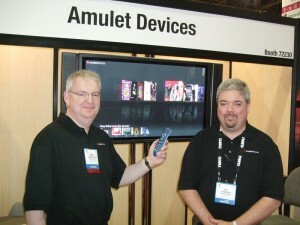 You can see live and in person the Amulet Devices Voice Remote for Windows Media Center. This meet-up brings together digital entertainment enthusiasts and experts from around the Houston-area, hobbyists and professionals who have embraced the power of the PC to power their digital entertainment experiences – everything from home theater PCs running Windows Media Center to PlayTo devices, home entertainment networks and mobile devices. See the Missing Remote for more details. We now have the online store up and running and to celebrate the launch, we’re offering a 10% discount on the Amulet Voice Remote. This is a great accessory for Windows Media Center, which is part of Windows 7. 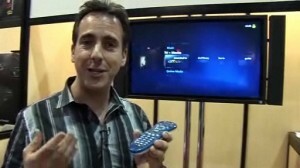 We have the remote and also an IR receiver available via the store. This addon might be needed if you don’t already have an infra-red receiver with your Media Center. We plan to add some extra accessories, including additional high quality voices for use with Amulet’s Media Center plugin. As we use standard SAPI voices, they will also be available to use in other Windows Speech-enabled applications. 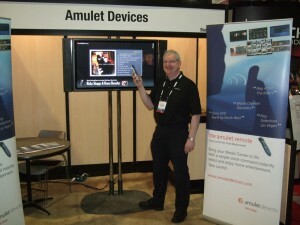 Just back from CEDIA 2010 where we delighted those that have been following our progress since last year by saying they could now buy our Voice Remote. On our stand we also demonstrated our voice control integration with Bitwise Controls‘ Home Automation system, which excited Bitwise and their new distributors alike. We hope to have this plugin available as a product for System Installers in the next few months. It’s a great addon for our technology, bringing simple voice control to Home Automation. We were invited to attend this year’s UK Windows Media Center & Windows Home Server User’s Group meeting in Birmingham on Saturday 12 June, and brought along our latest Amulet voice remote and software addon for Media Center to show-off. CES 2010, Las Vegas not so hot! I had previously been to Las Vegas in the middle of a heat wave, with the temperature soaring to 50 degrees C. So I was a little disappointed to find it chilly wearing shorts! Anyway, the regular consumer electronics behemoth of a show that is CES kept us busy. Posted in Events | Comments Off on CES 2010, Las Vegas not so hot! The show has been very busy for us over the past couple of days. Lots of foot traffic. Overall attendance seems down from the last time we visited in 2007, but the visitors this year are much more focused and serious – no tyre kickers! Steve Ballmer’s keynote speech was quite engaging, with plenty of pyrotechnics. Of interest to us was the comment by the Media Center program manager that there are now more than 10 million Media Centers regularly connecting to Microsoft’s electronic program guide. Good to see some local Irish journalists and other Irish exhibitors here. In fact, we’ve had plenty of international visitors, from countries including Germany, Norway, Denmark, the UK, France, Spain, Sweden and Japan. There’s a lot of interest from potential licensees, not to mention a large well-known Japanese consumer electronics firm. While we’ve visited CES before, this is our first time exhibiting here, so things are a lot more frantic than usual. Our booth is in the Sands Convention Centre, just beside the Venetian, which is quite a decent place to be – lots of interesting technology companies in close proximity to us. Although booked our own stand space back in August, our shortlisting for i-Stage means we also have a booth in the new i-Stage area. With only myself, Steve, Garry and Pat attending, this was stretching ourselves quite thinly – but just about doable. Our A/V supplier sent us Plasma screens instead of the requested LCDs, and neglected to provide any speakers. Getting all this sorted out took some time. We also ran into trouble finding the particular Kinco’s that had printed our press release (who would have guessed there’d be so many outlets that close to the exhibition center). But after a few frantic hours, everything was ready.